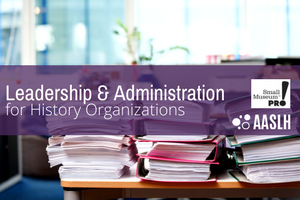 History museum leadership is more complex and demanding than ever before, requiring updated and innovative ways to meet mission and keep organizations healthy. Thoughtful, intentional museum administration and leadership matters, regardless of the size or focus of your organization. This online course covers governance and administrative structure, nonprofit status, mission and vision, board and staff responsibilities, the relationship between board and staff, strategic planning, human resource management, and leadership.